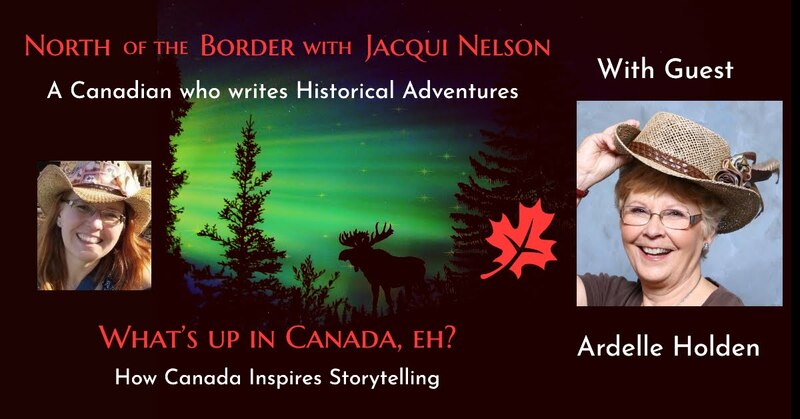 Who’s next on my North of the Border guest blog series? Today we have Ardelle Holden, author of A Person of Interest and Murder by Bits and Bytes! I started out as a child, but soon became a gas jockey, chambermaid, waitress, switchboard telephone operator, marine radio operator, catalogue clerk, bank teller, securities clerk, air service radio operator/office manager, shipping clerk, wife, bookkeeper in aviation and mining exploration, rivet bucker, columnist, wild rice harvester, mother, teacher, videographer, seamstress, student, medical office assistant, scrapbooker/retailer, government statistician, photographer, artist, and author. 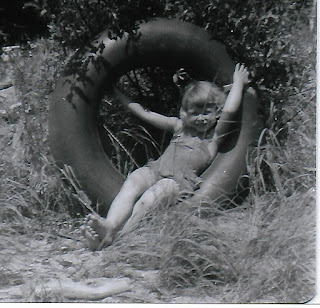 In the event that I never grow up, at least I have found my niche – writing. 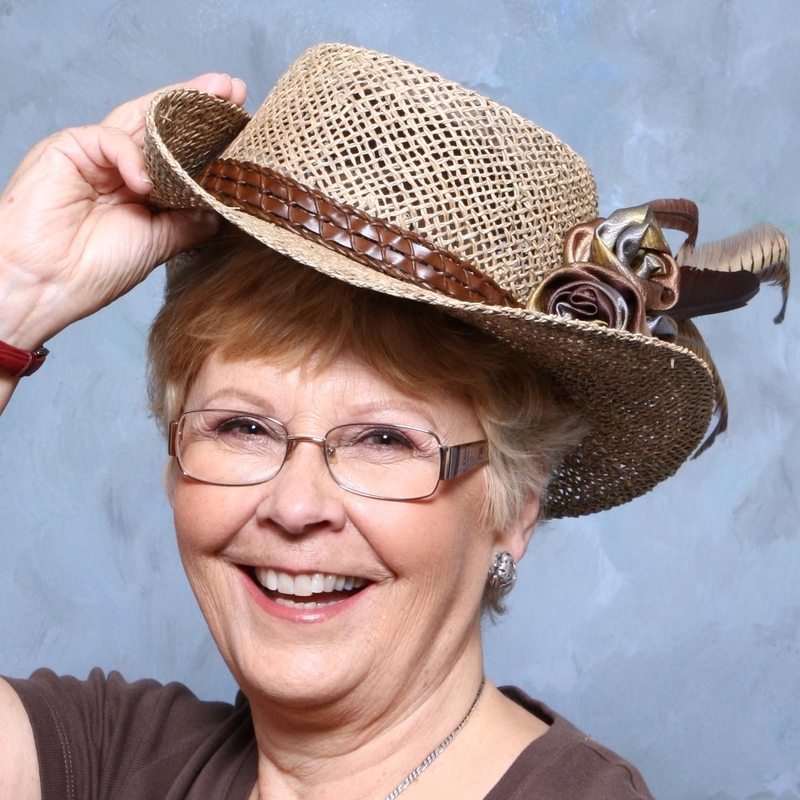 Throughout my life, I have been writing. From articles and Art Society columns for my local paper in Manitoba, to grant applications and business manuals, and letters that verged on tomes – as evidenced by the additional postage necessary. My poetry and anecdotes have been published in the Ojo del Lago in Ajijic, Jalisco. But A Person of Interest was my first novel - my baby - with the gestation period of an elephant. Samantha’s pulse raged. Could they hear it from down the alley? She hesitated, held her breath, and listened. In the darkness, pelting rain muffled the voices of the two men she knew would soon round the corner and see her silhouetted against the light from the street beyond. Ahead she spotted the dark recess of a delivery entrance. As her mind raced, Samantha’s feet struggled in nightmarish slow motion against the grip of debris and rushing water that conspired to drag her backwards into danger. The instant she reached the doorway, she leapt up onto the threshold. Pressing her back hard against the ridges of the cold metal door, she wished she could melt into it like a Dali watch. I don’t know what inspired A Person of Interest except to say I had nightmares as a child. Trying to escape in slow motion while my demons had the speed of a cheetah filled my little heart with terror. I would wake in a sweat, panting. Those were the nights I ran to my parent’s bed and snuggled down between them. 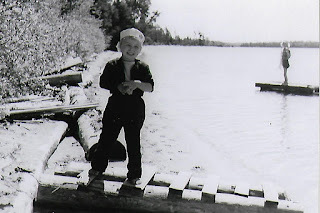 But the cottage in A Person of Interest is based on a version of my childhood summer camp on Vermillion Lake in Northwestern Ontario – and here’s why. 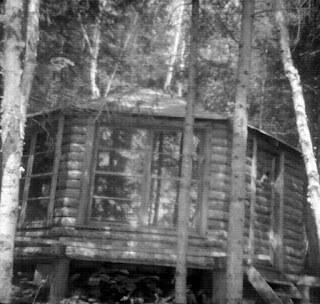 My father, Robert Rowell Bowman built Bow-Manor in an octagon because the logs, which were actually railway ties, were only eight feet long. 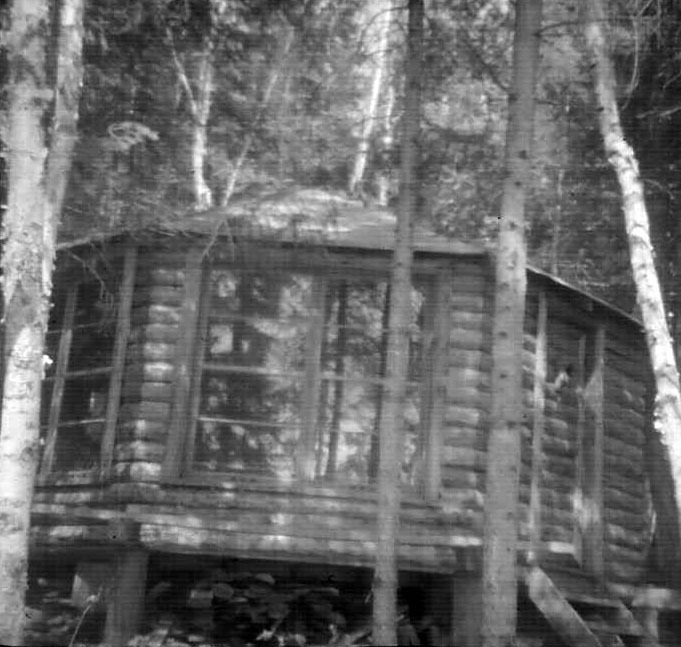 After a few years, he added a verandah around the front three sections of the cabin and bedrooms off either end of it. All bets were nailed to the floor before he ceremoniously cut off the centre pole. Despite the ever present possibility of bear encounters in my wanderings, growing up at camp was peaceful. I traipsed up the beach visiting my friends in other camps, pressed wildflowers and leaves, chopped wood, swam, fished, built rafts and daydreamed. There was a secluded spot on the point between our beach and the big beach where I could sit on a huge rock completely hidden. The rock had a hollow carved out of it just waiting for a day-dreamer like me. I could look down into the water and watch the minnows skimming over the sand between the rocks. Leaves would float by and bob on the wake of passing boats. 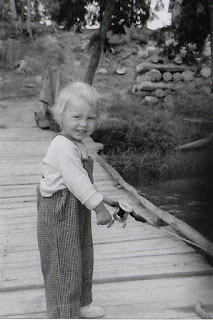 The chirping birds, the lapping water, the boats and the jingling of the poplar (aspen) leaves are as fresh in my mind now as they were sixty years ago. You can see the point behind Sniffer and me at the end of our beach. Sniffer was from Hollywood, but that’s another story. I visited many far flung places from my rock. I think I was even on the dig at Troy. That’s the year I was reading of adventures in archaeology. 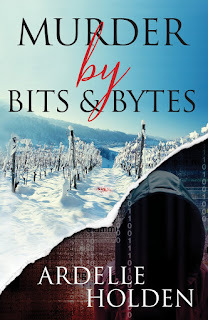 So, you can see why, when I needed the perfect refuge for Samantha, I chose a version of Bow-Manor, but then I couldn’t foresee the violence at Chambers Lane Cottage in Murder by Bits and Bytes. 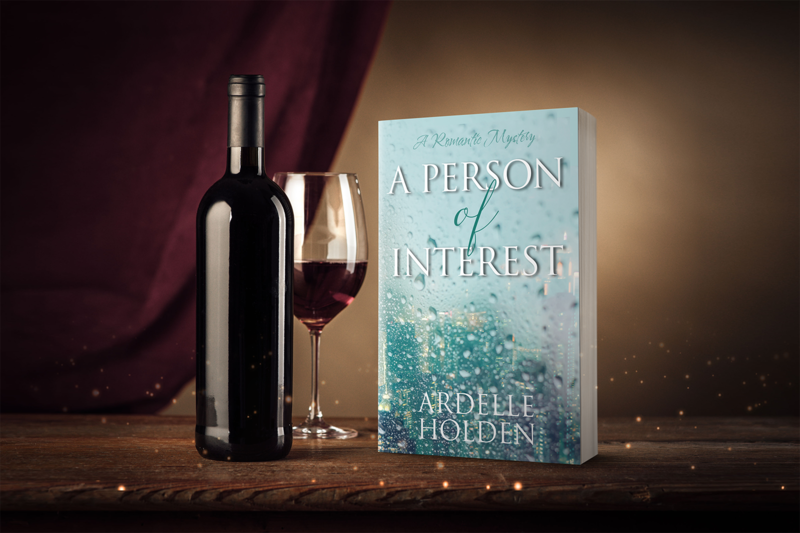 Getting to know Samantha and Ben in A Person of Interest has been an extraordinary experience, so much so that I could not leave them to live their lives in peace—I had to revisit them. 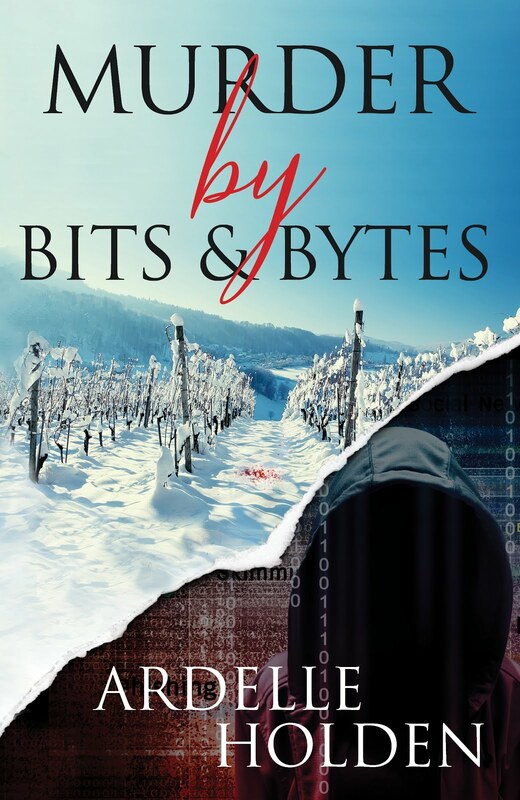 What I discovered so horrified me I had to write the sequel – Murder by Bits and Bytes. A sneaker bobbed against a rock. She ignored the bone-chilling water as she rushed in to grasp the shoe before it could be swept away. It was Ben’s, and it was still laced… Samantha screamed his name as she scanned the steel-grey river downstream as far as she could see. She squinted into the depths of the overhanging vegetation on the other shore. Pitching over the slippery rocks and sand along the shore, she spotted two deep drag marks that scored the embankment. Almost blinded by tears, her eyes darted across the surface again, upstream and down, before she staggered up past the fire pit, following the drag marks to where they grew faint in the hard ground at the foot of the front steps of the cottage. There, they ended – or began? Chamber’s Lane Cottage was no longer Samantha’s peaceful refuge. before the summer beach reading season! What was your favourite summer place where you could just be? Bow-Manor was that place for me as a child. How about you? ~ All pictures (except for the 1st) are supplied by today’s guest with their assurance of usage rights. It sounds like Coos Bay was a wonderful refuge for you. I'm glad you got to spend time there as a child, Peggy. I understand your love of connection to the ocean. 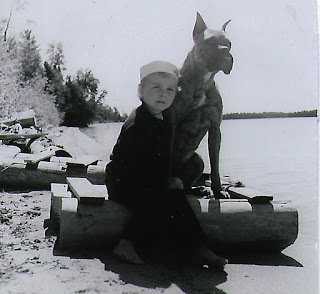 My grandfather had a fish house on Lac Seul in NW Ontario and I get very nostalgic whenever I hear a seagull cry. Thank you so much for sharing your story with me. It's nice to learn a little more about the author. Great journey. Thank you for sharing your story. 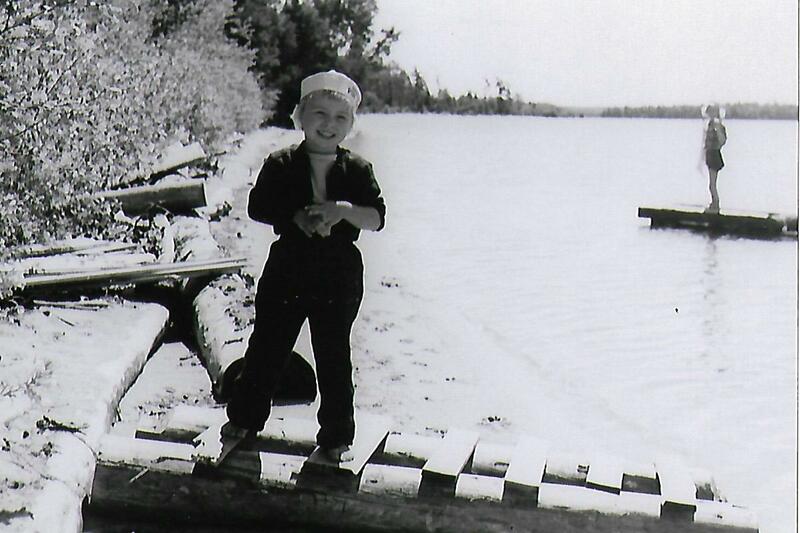 My grandparents had Bowman Fisheries on Lac Seul in NW Ontario. I spent many hours swimming between the docks and watching the planes being unloaded. Your grandparents farm reminds me of my aunt and uncle's centenary farm in Manitoba. They had a 'secret' back staircase that lead down to the kitchen. My cousins and I loved hiding out there. My biggest memory of their farm was the complete darkness at night. There was absolutely no light pollution. And they were the first 'recyclers' that I ever met. They'd say Burn Bash or Bury and Liquid - leave it. Solid - sink it. Ha! Thank you for visiting, Marion Ann, my fellow NaNoWriMo winner!